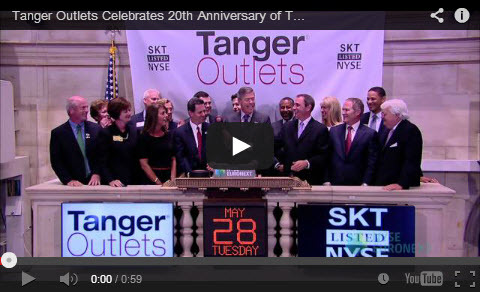 Tanger Factory Outlet Centers, Inc. (NYSE:SKT), is a publicly-traded REIT headquartered in Greensboro, North Carolina that presently operates and owns, or has an ownership interest in, a portfolio of 40 upscale outlet shopping centers. Tanger's operating properties are located in 20 states coast to coast and in Canada, totaling approximately 14.4 million square feet, leased to over 2,900 stores which are operated by more than 500 different brand name companies. The Company has more than 38 years of experience in the outlet industry. Tanger Outlet Centers continue to attract more than 181 million shoppers annually. For more information on Tanger Outlet Centers, call 1-800-4TANGER or visit the Company's website at www.tangeroutlets.com. Tanger Outlet Centers are characterized by a tenant mix of leading designer and brand-name manufacturers. Each shopping center provides a unique opportunity for customers to purchase a variety of brand-name products for the entire family directly from the manufacturer at substantial savings. Any shareholder or interested party is welcome to communicate with our Chairman of the Board, any other director, the non-management directors as a group or the Board of Directors as a whole by writing to the directors as follows: Tanger Factory Outlet Centers, Inc., Attention Chairman, c/o the Corporate Secretary, 3200 Northline Avenue, Suite 360, Greensboro, NC 27408. All communications, except for marketing and advertising materials, are forwarded directly to our directors. As of April 25, 2019 10:36 AM ET or Minimum 20 minute delay.